Habari Gani? Nia! Bring your positive energy, your shekere, your bells, your Afrikan instruments and your dancing feet to celebrate our "Purpose" as the Griot’s of the AUSA people! 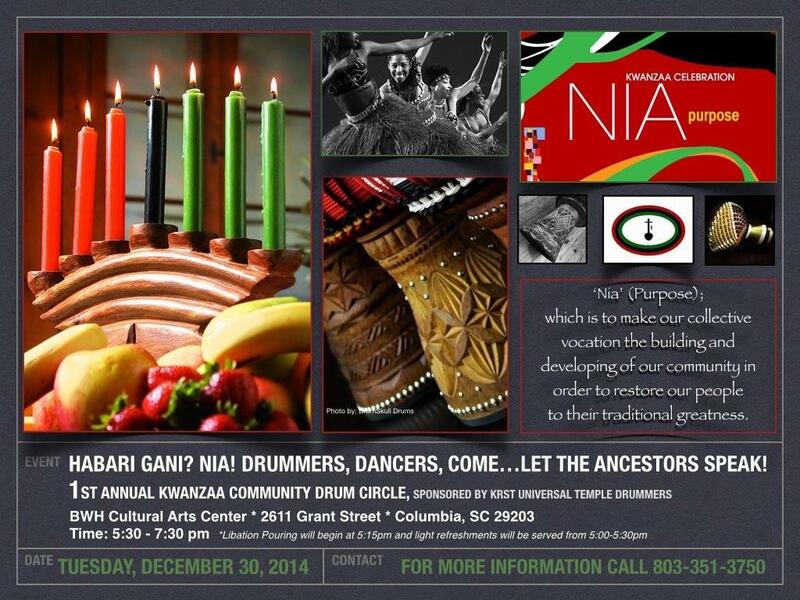 Join US for the 1st Annual Kwanzaa Drum Circle at the BWH Cultural Arts Center, 2611 Grant Street, Columbia, SC 29203. For more information ‪#‎KwanzaaSC. Libation pouring at 5:15 p.m. Light refreshment will be served from 5:00 to 5:30 p.m.
For more information call 803-351-3750.